Quiet Door™ Acoustic Panels were designed to reduce noise transfer through the metal doors commonly used in hotels, condominiums, apartments and offices. The Quiet Door™ Acoustic Panel is a two part composite. The first material used is a sound deadening, visco-elastic polymer designed to “deaden” steel, by significantly reducing structural borne sound energy. The sound deadening material is a professional soundproofing product, used in a variety of other applications where structural vibration is a problem. The visible second material used is an attractive, fabric wrapped acoustic panel with a high density Acoustical Glass Mineral Wool core. The door covering will help reduce echo and is available in a large variety of fabric options. This product is best used in applications that require low to moderate soundproofing with low to moderate noise levels and where aesthetics are important. Quiet Door™ Acoustic Panels will treat standard 32 in. to 36 in. x 80 in. tall steel doors. Large Variety of Special Order Fabric Options, Sizes and Thicknesses are available. Dual Door Soundproofing Function — The Quiet Door™ Acoustic Panel reduces the amount of noise transfer from one side of a steel door to the next and helps reduce annoying echo within a room. Aesthetic Value — The Quiet Door™ Acoustic Panel offers a professional fabric finish that compliments any office or home décor. The in-stock door covering is wrapped in a neutral, beige fabric. Variety — Compliments any decor, due to a large variety of available fabric coverings. 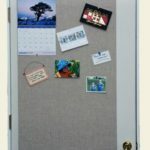 Quiet Door™ Acoustic Panel can be covered to match your Udderly Quiet™ Acoustic Panels or existing acoustic treatments. 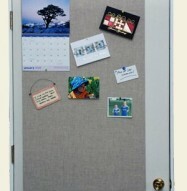 Quiet Door™ Acoustic Panels can be customized to fit any door size. Please contact our Acoustic Consultants for details! Ease of Installation — Quiet Door™ Acoustic Panels can be installed in less then 30 minutes. The sound deadening material, under the fabric covering, is a peel and place application and the fabric door covering is installed with Hook and Loop (Velcro®). No glues or special tools required. If you can use a tape measure and a pencil, you can install this product. Low Profile — Quiet Door™ Acoustic Panels can be used where space is limited. This product, when installed, is only 5/8 inch thick and will not obstruct the doorway entrance or the function of the hardware. Flammability — The exposed surface of Quiet Door™ Acoustic Panels carries a Class A™ flammability rating. Impact Resistant — Quiet Door™ Acoustic Panels were engineered for areas that have heavy traffic. The exposed surface is made from high density Acoustical Glass Mineral Wool that resists common impacts. Tackable — The Quiet Door™ Residential Door Soundproofing Kit accepts push pins and Velcro®. Post important messages, reminders or personal photos for yourself and others. *Fabrics are 100% recycled, not entire product. Quiet Door™ Acoustic Panels are available in ½, 1 and 2 inch thicknesses and can be sized to fit any sized door. For details please call 1-866-949-9COW and our Acoustic Consultants will be happy to help. Quiet Door™ Acoustic Panels are available in an endless variety of colors, textures and patterns. Fabrics are typically used to improve or maintain the aesthetics of a space. 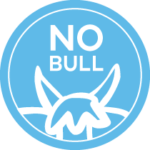 All of the fabric options are made with 100% recycled polyester fibers and may be cleaned with mild, water-based cleaning agents. Materials Needed: All mounting materials are included.